In Balinese, Dewa Baruna is the name of the Hindhu sea god. It is from this deity that Baruna Silver takes its name; and it is on Dewa Baruna’s birthplace – Bali, the island of the gods – that Baruna Silver has its origins. Baruna Silver was founded by diving enthusiasts who were determined to turn their love of the island and affection for diving into a specialty business. It was only natural that they chose to work with silver, one of the traditional crafts of Bali. And thus Baruna Silver was born – jewellery for divers and admirers of Bali alike. All of the jewellery in the Baruna Silver collection is handcrafted by traditional Balinese gold and silversmiths. 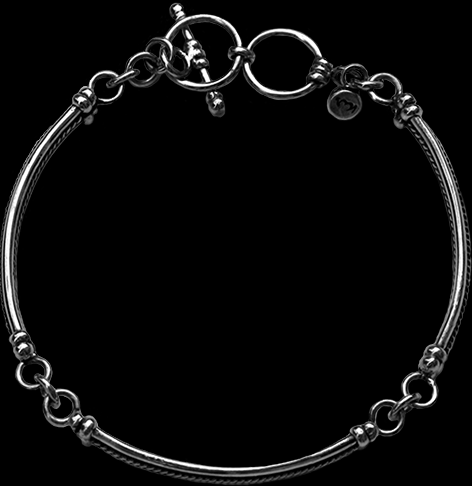 The silversmiths create all components of the silver bracelet individually with loving care, using the tools and techniques that have been employed in Bali for centuries. They begin by braiding silver wire to create the beautiful bracelets of the Baruna Silver collection. Then, they carefully apply silver balls and rings, adding texture and charm to every piece. Because of the handcrafted nature of Baruna Silver, each piece is unique. Even the caps of the rubber bands are made individually by hand. Like any other piece of Baruna Silver jewellery, these sporty yet elegant rubber fascinators get their own Baruna Silver brand charms, giving each piece a distinctive look.